"I was a little concerned about taking this online training class due to the disconnect. I usually prefer to take courses like this in person. I was pleasantly surprised, however, by how the training resembled an in true class environment. The class was small and Darwin was always willing to field questions from the students. The material was great and working with the provided virtual machine created a true hands-on experience that helped reinforce the material. 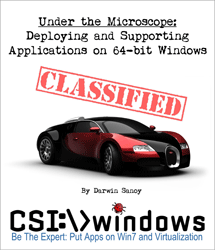 I would (and will) highly recommend Darwin to anyone in need of Windows 7 and Windows Installer training. Thanks Darwin!" "Darwin is a well renouned industry expert on Microsoft packaging technologies. It is a pleasure to be able to learn from his wealth of experience and knowledge. His course on Windows 7 Packaging Update is a great kickstart introduction for learning the "need to know" items for packaging in a restricted user environment." "I continue to be impressed with the quality of instruction I receive from DesktopEngineer and now CSI-Windows. With every course, I learn practical, invaluable, and immediately applicable skills." "This class was very helpful in sharing new features in Windows 7 from an operational point of view. I would refer others to this class. Great learning experience!!!!" "Even though I signed up only a few days before the class, I received all the materials in plenty of time to prepare for the first session. Class was presented very well and Darwin is an excellent source of information on all subject matter related to CSI-Windows.com courses." "This is my second course with DesktopEngineer.com / CSI-Windows.com and as usual I wind up with more resourses and information then I can apply at one time. I find all couse work done through DesktopEngineer.com / CSI-Windows.com to be first rate." "I had heard good things about Darwin's classes from some reputable people frequenting the usual repackager sites. I was reluctant to believe that an online experience would be equal to or be better than face-to-face training. I figure it was cheaper so you get what you pay for. I started to feel better when the course materials came through the mail, and after a quick scan of the course DVD and workbooks, I was excited to get going. The learning portal and the web conferencing service were pretty solid and getting them set up was no problem. I felt the Meet -n- Greet run through the Friday before the class did a lot to take the worry out of not being able to get going for Monday's class when it was time. After the first hour of class I couldn't help but be impressed by the web conferencing service. It was easy to work. I had good audio with minimal lag and the interaction that you have with the instructor and other students, in face-to-face training was there as well, without having to put an airline ticket, a rental car, lodging, and meals on an corporate card with an expense report to reconcile. Not having the overhead expenses is probably what allowed me to get the approval to take the class. I never doubted the content, but the quality of a distance training presentation was a concern that quickly faded."